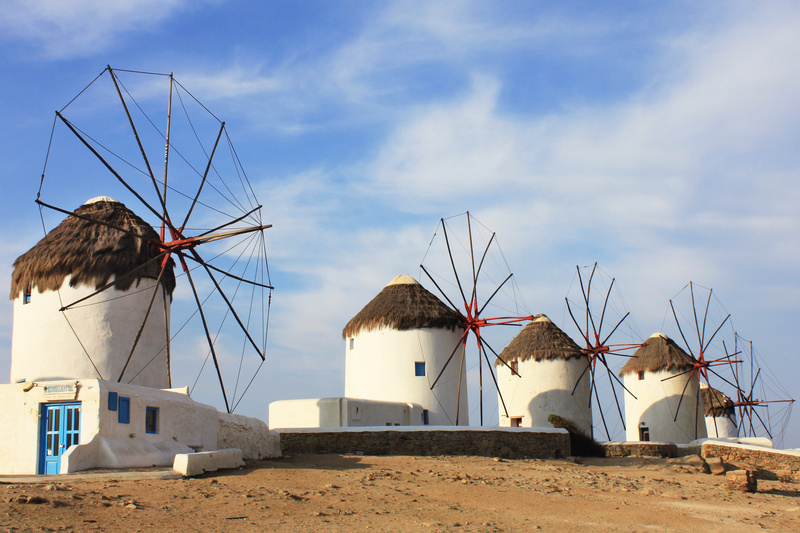 Discover the fascinating Greek Cyclades islands as you wish, following your unique & flexible island hopping trip. Pick up the hotels & islands that you like the most & add the journeys if you like. (“Open jaw flights” are possible: For example, outbound flight to Santorini, and return flight from Mykonos). You can also optionally add a sailing trip and get to know the hidden beauties of some lesser known islands. 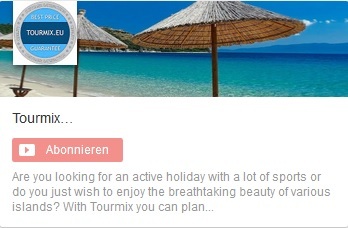 Create your own tour: Get more information about ‘Popular Cyclades island combinations’ or directly click on ‘Request’ to mix your tour. Which Cyclades islands should I choose? Which beaches? Which regions? 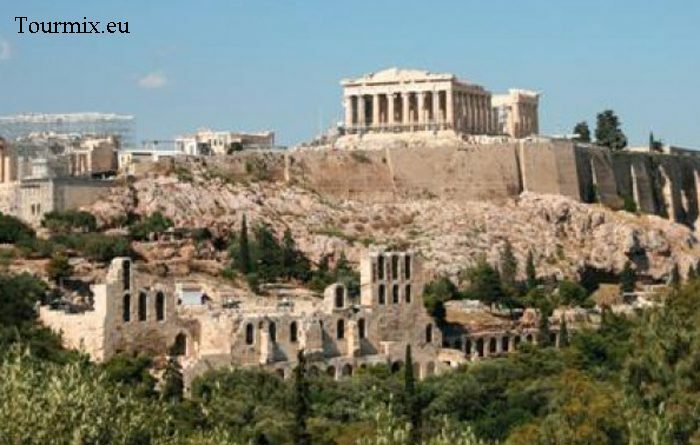 … or choose one of our package tours for 14 days! The Greek Cyclades are far more than just blue and white patches of colour. Each island has its own, unique character – the breathtaking natural beauties, the multitude of cultural sights and the world-famous beaches keep inspiring Greece enthusiasts. Each island is worth being discovered. Our package tours are composed of approved island combinations. Are you interested? Just click on ‘Request’ and you will be transfered. Santorini – almost every day. Island mix from the whole list, optionally add a sailing week through the smaller islands. Mykonos – almost every day. Mix of Cyclades islands from the whole list. 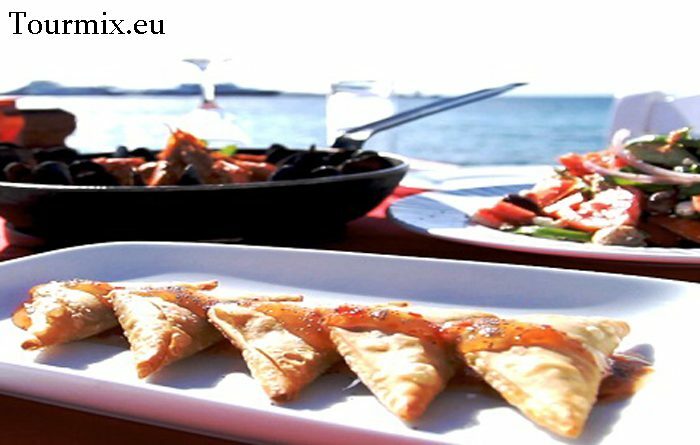 (Sailing week starts every Saturday; Mix with sailing week, with a stay or additional days on Naxos or Santorini). Why are the Cyclades so popular? 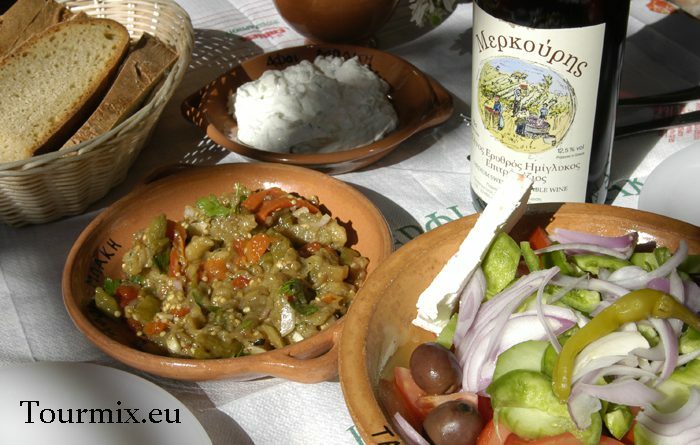 The world of the Greek islands is like a richly laid table, from which you can make a menu to your taste. With the program “Island hopping on Greek islands”, we would like to offer you many flexible alternative choices for your vacation. The most famous paradise for island hopping all over the world are the Greek islands of Cyclades. Our 34 island hopping Cyclades tour works on offering a selection of the most beautiful islands among “the Pearls of Cyclades”. Dive into a wonderful world of islands, which are only two or three hours away from you by plane. Both Mykonos and Santorin have international airports with direct connections to many European airports. Among over 210 islands, the most popular are Santorin, Paros, Naxos and Mykonos as well as Syros with its beautiful city Ermoupolis, the capital of the archipelago, Tinos, Andros and Ios. These islands are a favourite for island hopping through the Cyclades, because the journeys between Mykonos, Paros and Naxos last less than one hour, and ferries sail several times a day during the summer betweenthe islands. Santorin is the most spectacular island of Cyclades thanks to its villages that are situated on the edge of a huge volcanic crater and allow a spectacular view. 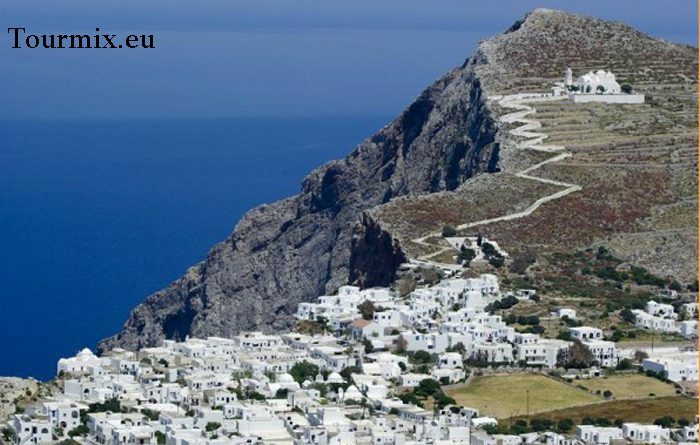 The port in Santorin wil fascinate you. Mykonos smartly created an atmosphere where glamour and naturalness, chic night life, good shopping and peaceful sand beaches harmoniously complete each other. The biggest and the greenest island of the Cyclades is Naxos, which attracts visitors with its raw nature and dune beaches in the South. The North of Paros can hardly be a better place for wind- and kite surfers, and the streets in Parikia will ravish young people. The biggest islands of the Cyclades are Amorgos, Anafi, Andros, Antiparos, Delos, Folegandros, Gyaros, Ios, Milos, Naxos, Paros, Kea, Kythnos, Makronisos, Mykonos, Santorin, Serifos, Sifnos, Sikinos, Syros and Tinos. Santorin seems to visitors completely differently compared to other islands of the Cyclades. The current shape of the island is the result of what has been left after the powerful volcanic eruption ca. 1500 B.C. : the main island Santorin, the neighboring islands Thirassia, Nea Kameni, Palia Kameni and Aspronisi as well as the giant crater “Caldera”, which poured into the sea. Thira, the capital of the island is located on the West side, on the edge of the high escarpments of Caldera. The typical houses in Thira have a unique architecture style: small and whitewashed, the houses are decorated with arches and plenty of small windows. 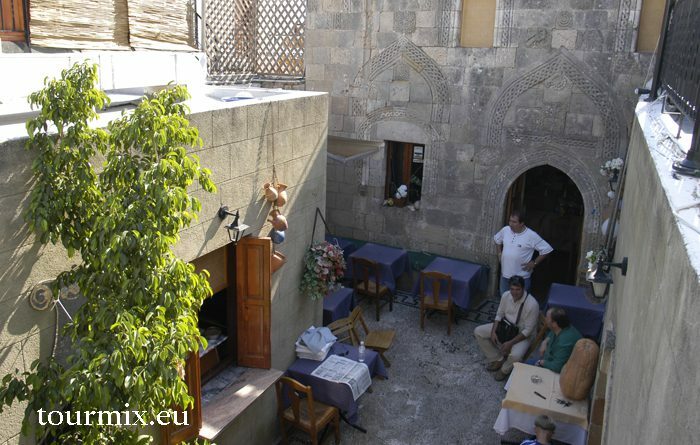 A large number of boutiques, restaurants and souvenir shops can be found in its narrow streets. 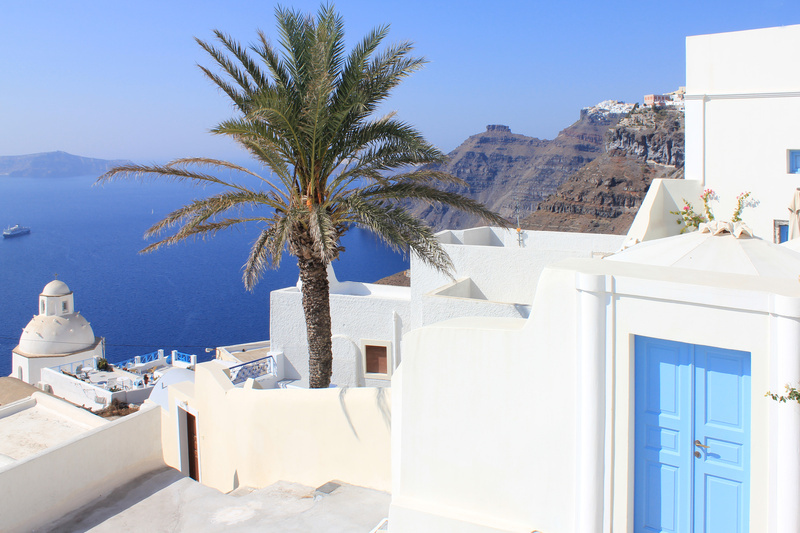 Youwillbe blown away by the small place Oia (spelt Ia) on the North coast and the view it offers. The houses of the picturesque captain’s village were built in the drained lava rocks. The winding roads will all lead you to the traditional ports of Ammoudi and Armeni. The Island is only 85 square km large, but has developped into one of the most appreciated island in the Aegean. Many tourists, who are staying on the neighboring islands like Paros or Naxos, and want to continue their journey first come to Mykonos, because of its airport, which is the second biggest in the Cyclades. It’s also a starting point for island hopping through the Cyclades. The pros of choosing Mykonos as a holiday destination are its 3000 of sunshine hours per year, gold sand beaches with crystal clear water and the traditional architectural design, with the typically white and blue houses. On top of it, its direct neighbor the antique island of Delos, and its ruins also attract many tourist. Mykonos has very good ferries connection with the islands of Piraeus, Raphine, Iraklion (Crete), Santorin, Ios, Paros, Naxos, Skiathos, Syros, Thessaloniki and Tinos. It’s possible to fly to Mykonos from Athens, Amsterdam, Berlin, Brussels, Dusseldorf, Cologne/Bonn, Monaco, Wien, Salzburg, Zurich and many other cities in Europe. Mykonos is definitely one of the most reachable islands of the Cyclades. The biggest island contrasts with the rest of the archipelago thanks to its landscape diversity. It can be proud not only to have the highest mountain of the Cyclades (1,001 m high Zas), but also for the biggest olive groves and itsmiles long beaches. Tourists, surfers and art enthusiasts gladly come again and again here. The island is one of the wealthiest and most powerful islands of Cyclades. The sellingof the marble of Naxos goes backto no less than prehistoric time. On Naxos appeared the first sculpture schools, where famous figures which served as a foundation of sacred Delphi and Delos were made. Two marble colossi from the 7th and 6th century before Chirst were found recently on Naxos. The narrow streets of Naxos will allow you to observe silence and peace of mind. Feeling like embracing life and its hectic? Take a walk on the promenade, where small hotels, tavern, cafes and souvenir shops are gathered together. The beautiful and long sand beaches in the South of the capital Chora, invite tourists to relax in the crystal-clear water. Paros was an important and wealthy island already in ancient times, because the Parian marble, the oldest in the world, was exported to all major countries. The island presents itself as a paradise for vacation nowadays, with beautiful beaches, pretty flowery villages and many historical sights, including marble gallery. 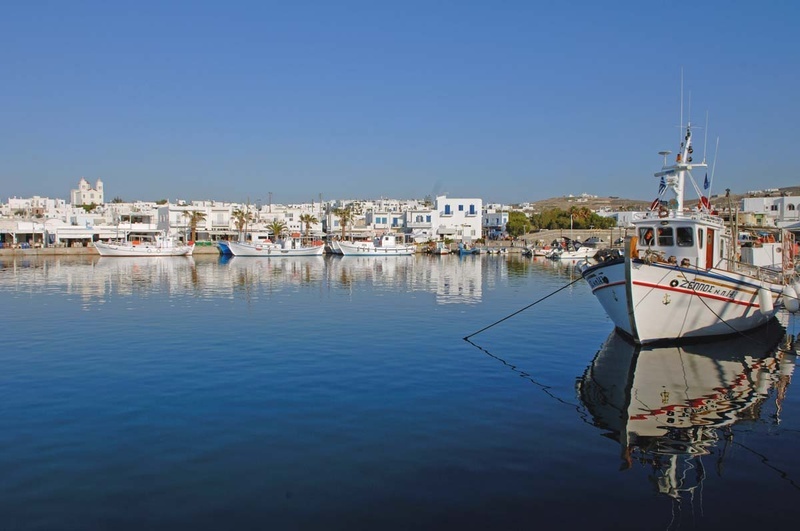 Together with Mykonos and Santorin, Paros is one of the best known islands in the Cyclades. Despite 755 meters high Agios-Illias-Massivs, the landscape is mostly composed of big fertile plains. The picturesque villages of Parikia and Naoussa are famous for their charming beaches, traditional architecture, with hibiscus and oleander decorated small valleys, countless whitewashed churches and fishing boats on the beach that became the trademarks of the island. The beaches of Kolimbithres in the North are very small, almost like private bays with fine sand beaches that are ideal for families with small children and non-swimmers. This island is a mixture of quite corners to relax and places with an active nightlife. Amorgos is the biggest among the smallest islands of the Cyclades. It covers over 126 sq. km, and fascinates every visitor with its wonderful beaches, mountainous landscapes and the traditional lifestyle. Chora is the capital of the island, which combines traditional architecture and a great historical tradition. Remarkable are Agioi Pantes Church, the cathedral, Vlissani, Agios Nikolaos and monastery Fotodoti Christou, the historical castle as well as a fantastic archeological collection. If you leave Chora in the direction of Kato Meria, you will find a Byzantine Panagia Chosoriotissa monastery that is of a high religious and historical importance. There are many historical relicts of rare architecture patterns. Each year, thousands of tourists go 300 stairs up that lead to the center of steep rocks, to admire the magnificent landscape. The bay of Katapola together with the simple Cyclades architecture and the port with fishing boats create a picturesque countryside image. The bay consists of three places: Katapola, Xylokeratidi and Rachidi. The Panagia Katapoliani Church and Byzantine Church of Evangelismos, the mount Mountoulia with ruins of ancient Minoa as well as the old dam and Lefkes arouse special interest. The most beautiful beaches are: Kato Akrotiri, Maltesi, Treis lerarches, Agios Panteleimonas, Phinikies, Tiromos and Agioi Saranda. 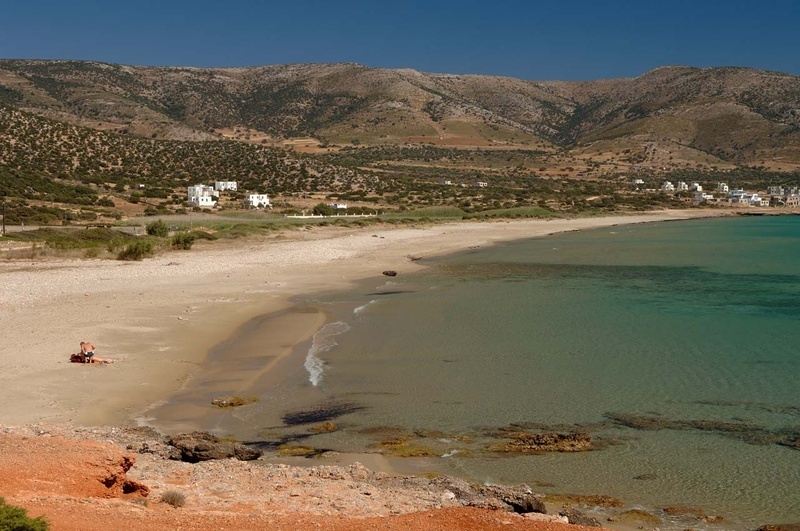 In the Southeast of Naxos are three islands with outstanding beaches and isolated bays called Koufonissia. These islands are: Pano Koufonisi and Kato Koufonisi that are separated by a 200 m broad straits, and Keros. Pano Koufonisi is the smallest and the most densely populated island of the Cyclades with an area of only 3.5 sq. km. and 285 inhabitants. It is a real fishing island. All the inhabitants earn their lives from fishing. Kato Koufonisi has an area of 4.3 sq. km. and is nearly uninhabited, but it has beautiful lonesome beaches that are a favourite among many nudists. The biggest attraction of the island is Panagia Church that was built on ancient ruins. Keros is a neighboring uninhabited island that is currently protected as an archaeological monument. Here were found many important art objects from the Cycladic culture. 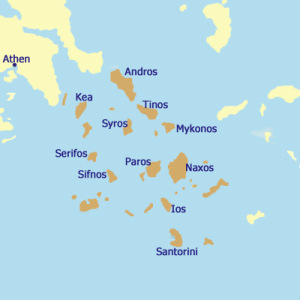 Some of the small uninhabited islands that surround Koufonisia are: Porios, Koufonisi, Charokopos, Parianos. Ios belongs to the smallest Greek islands in the South of Cyclades with an area of 100 sq. km. and a population of ca. 1500 inhabitants. The island lives mainly from tourism. Many visitors from the Greek continent and from abroad, mainly young people, are coming to these picturesque islands during summer months. Additionally to Chora, the beach of Myloptas and theport of Gialos, the island is full of Discos, Bars and Taverns. The island is known for the legend that says Homer’s grave should be in the middle of the triangle Paros, Naxos and Santorin. Thecenter of the city constitutes the main attraction of the island: it is considered to be a party island during the peak season. Outside the capital Chora, which was built on the hillside, and in low season, you can find peace on marvelous beaches and bays that would deserve to be explored individually. Besides many impressions of Cyclades, the island offers more than 350 churches and chapels with blue domes. You can travel to Gialos with ferries, which isa rather quiet place with taverns and nice shopping opportunities. There are good connections to Chora, one of the most idyllic villages of Cyclades.